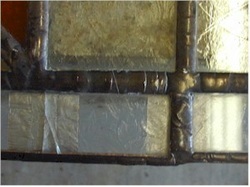 This type of repair only works when you can easy cover a crack in the design. 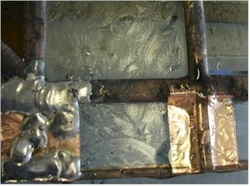 We do this by covering the crack with copper foil and soldering over the foil. We do this on both sides of the glass, thereby creating the illusion of a lead line. The design to the left is the design we're going to demonstrate with. 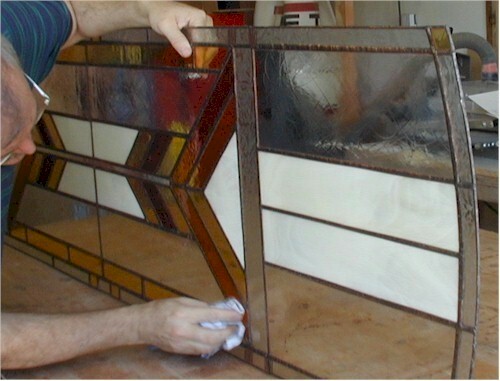 This panel had a weakness in the design and the side glass was cracked when the glass was being encased in tempered glass. 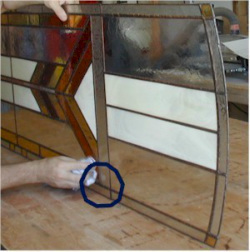 You can see the crack in the glass and if you look carefully, you will see that additional copper foil has already been applied to the backside of the glass. 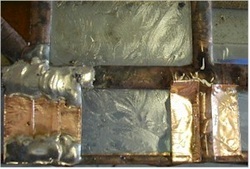 Here the foil has been applied to this side and the top and bottom edges of the "patch" have been soldered. The line on the right has to be thickened to add balance to the entire design. Next, solder is applied in a random manner to the rest of the patch. Care must be taken to avoid getting any place too hot or the glass will break from the heat. I randomly solder back and forth until, first one side and then the other are completely soldered. I've left the solder joints rough instead of smoothing them because this window is supposed to look old and rustic. 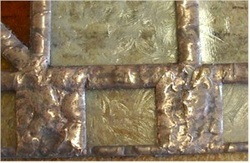 Here, the finished joints are cleaned and a copper patina has been applied. Each of the four corners of the window received this treatment. 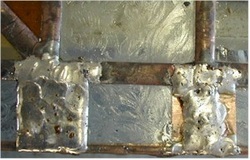 Both front and back had to be soldered, using care to avoid excess heat. But when it was done, the panel looked better than it did originally.